Designs will be featured on the website! All Methacton Students Invited to Participate! 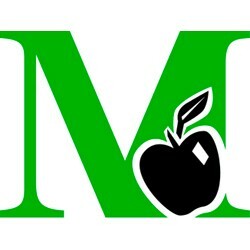 Once again, Methacton will gather holiday card greetings to be featured on our website throughout the holiday season. We look forward to gathering designs from students throughout the district. 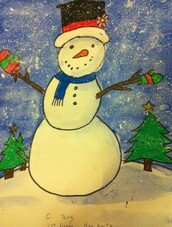 Help us spread the holiday cheer and feature our talented students! Pictured at right: Gi Tang's (now Grade 2) snowman, featured in the 2013 Methacton Holiday Card. Digital designs can be submitted to Angela Linch, Coordinator of School and Community Information, at alinch@methacton.org. Paper designs may be submitted at any school, simply drop your drawing in the box in your school's main office. CLEARLY WRITTEN ON THE BACK OF THE DRAWING SHOULD BE THE STUDENT'S NAME, SCHOOL, AND GRADE LEVEL. Submitted work will be added to the site over the coming weeks, but should be sent in no later than Friday, December 12. Be sure to use lots of bright colors, and avoid religious themes. Questions? Contact Angela Linch or call 610-489-5000, ext. 15412.